Cat’s eye (Lehsunia) is gemstone for Ketu. Ketu in not a planet in solar system but as per jyotish astrology it plays a significant role in deciding a lot of factors related to various other planets in our horoscope. Wearing Cat’s eye tends to bring down bad effect of Ketu. 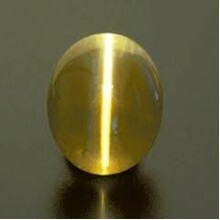 If you need success during ‘Ketu period’ and want to reduce the negative effects, Cat’s eye can help. The main source of Cat’s eye is Sri Lanka Ceylon mines. Product Description Gemstone Name : Chysoberyl cats eye Number of Pieces: 1 Pc Weight: 1.34 ct Gem Shape: oval cab .. Product Description Gemstone Name : Chysoberyl cats eye Number of Pieces: 1 Pc Weight: 1.44 ct Gem Shape: oval cab .. Product Description Gemstone Name : Chysoberyl cats eye Number of Pieces: 1 Pc Weight: 1.48 ct Gem Shape: oval cab .. Product Description Gemstone Name : Chysoberyl cats eye Number of Pieces: 1 Pc Weight: 1.52 ct Gem Shape: oval cab .. Product Description Gemstone Name : Chysoberyl cats eye Number of Pieces: 1 Pc Weight: 1.55 ct Gem Shape: oval cab .. Product Description Gemstone Name : Chysoberyl cats eye Number of Pieces: 1 Pc Weight: 1.57 ct Gem Shape: oval cab .. Product Description Gemstone Name : Chysoberyl cats eye Number of Pieces: 1 Pc Weight: 1.60 ct Gem Shape: oval cab .. Product Description Gemstone Name : Chysoberyl cats eye Number of Pieces: 1 Pc Weight: 1.66 ct Gem Shape: oval cab .. Product Description Gemstone Name : Chysoberyl cats eye Number of Pieces: 1 Pc Weight: 1.68 ct Gem Shape: oval cab .. Product Description Gemstone Name : Chysoberyl cats eye Number of Pieces: 1 Pc Weight: 1.80 ct Gem Shape: oval cab .. Product Description Gemstone Name : Chysoberyl cats eye Number of Pieces: 1 Pc Weight: 1.83 ct Gem Shape: oval cab .. Product Description Gemstone Name : Chysoberyl cats eye Number of Pieces: 1 Pc Weight: 1.90 ct Gem Shape: oval cab .. Product Description Gemstone Name : Chysoberyl cats eye Number of Pieces: 1 Pc Weight: 1.96 ct Gem Shape: oval cab .. Product Description Gemstone Name : Chysoberyl cats eye Number of Pieces: 1 Pc Weight: 2.02 ct Gem Shape: oval cab .. Product Description Gemstone Name : Chysoberyl cats eye Number of Pieces: 1 Pc Weight: 2.03 ct Gem Shape: oval cab .. Product Description Gemstone Name : Chysoberyl cats eye Number of Pieces: 1 Pc Weight: 2.07 ct Gem Shape: oval cab .. Product Description Gemstone Name : Chysoberyl cats eye Number of Pieces: 1 Pc Weight: 2.23 ct Gem Shape: oval cab .. Product Description Gemstone Name : Chysoberyl cats eye Number of Pieces: 1 Pc Weight: 2.33 ct Gem Shape: oval cab .. Product Description Gemstone Name : Chysoberyl cats eye Number of Pieces: 1 Pc Weight: 2.39 ct Gem Shape: oval cab .. Product Description Gemstone Name : Chysoberyl cats eye Number of Pieces: 1 Pc Weight: 2.43 ct Gem Shape: oval cab .. Product Description Gemstone Name : Chysoberyl cats eye Number of Pieces: 1 Pc Weight: 2.47 ct Gem Shape: oval cab .. Product Description Gemstone Name : Chysoberyl cats eye Number of Pieces: 1 Pc Weight: 2.48 ct Gem Shape: oval cab .. Product Description Gemstone Name : Chysoberyl cats eye Number of Pieces: 1 Pc Weight: 2.50 ct Gem Shape: oval cab .. Product Description Gemstone Name : Chysoberyl cats eye Number of Pieces: 1 Pc Weight: 2.53 ct Gem Shape: oval cab .. Product Description Gemstone Name : Chysoberyl cats eye Number of Pieces: 1 Pc Weight: 2.63 ct Gem Shape: oval cab .. Product Description Gemstone Name : Chysoberyl cats eye Number of Pieces: 1 Pc Weight: 2.71 ct Gem Shape: oval cab .. Product Description Gemstone Name : Chysoberyl cats eye Number of Pieces: 1 Pc Weight: 2.75 ct Gem Shape: oval cab .. Product Description Gemstone Name : Chysoberyl cats eye Number of Pieces: 1 Pc Weight: 2.99 ct Gem Shape: oval cab .. Product Description Gemstone Name : Chysoberyl cats eye Number of Pieces: 1 Pc Weight: 3.10 ct Gem Shape: oval cab .. Product Description Gemstone Name : Quartz cats eye Number of Pieces: 1 Pc Weight: 3.36 carat Gem Shape: oval mix .. Product Description Gemstone Name : Chysoberyl cats eye Number of Pieces: 1 Pc Weight: 3.39 ct Gem Shape: oval cab .. Product Description Gemstone Name : Chysoberyl cats eye Number of Pieces: 1 Pc Weight: 3.40 ct Gem Shape: oval cab .. Product Description Gemstone Name : Chysoberyl cats eye Number of Pieces: 1 Pc Weight: 3.73 ct Gem Shape: oval cab .. Product Description Gemstone Name : Chysoberyl Kanak khet cats eye Number of Pieces: 1 Pc Weight: 3.90 ct Gem Shape: oval ca.. Product Description Gemstone Name : Chysoberyl Alex cat's eye Number of Pieces: 1 Pc Weight: 4.03 ct Gem Shape: oval cab .. Product Description Gemstone Name : Chysoberyl Alex cat's eye Number of Pieces: 1 Pc Weight: 4.05 ct Gem Shape: oval cab .. Product Description Gemstone Name : Chrysoberyl cats eye Number of Pieces: 1 Pc Weight: 4.35 ct Gem Shape: oval cab .. Product Description Gemstone Name : Quartz cats eye Number of Pieces: 1 Pc Weight: 4.46 carat Gem Shape: oval mix .. Product Description Gemstone Name : Apatite cats eye Number of Pieces: 1 Pc Weight: 4.64 ct Gem Shape: oval cab .. Product Description Gemstone Name : Chysoberyl cats eye Number of Pieces: 1 Pc Weight: 4.86 ct Gem Shape: oval mix .. Product Description Gemstone Name : Chysoberyl cats eye Number of Pieces: 1 Pc Weight: 5.01 ct Gem Shape: oval cab .. Product Description Gemstone Name : Chysoberyl cats eye Number of Pieces: 1 Pc Weight: 5.02 ct Gem Shape: oval cab .. Product Description Gemstone Name : Chysoberyl cats eye Number of Pieces: 1 Pc Weight: 5.40 ct Gem Shape: oval cab .. Product Description Gemstone Name : Chysoberyl cats eye Number of Pieces: 1 Pc Weight: 6.00 ct Gem Shape: oval cab .. Product Description Gemstone Name : Chrysoberyl cats eye Number of Pieces: 1 Pc Weight: 6.03 ct Gem Shape: oval cab .. Product Description Gemstone Name : Chysoberyl cats eye Number of Pieces: 1 Pc Weight: 6.67 ct Gem Shape: oval cab .. Product Description Gemstone Name : Quartz cats eye Number of Pieces: 1 Pc Weight: 7.82 carat Gem Shape: ova.. Product Description Gemstone Name : Chysoberyl cats eye Number of Pieces: 1 Pc Weight: 8.65 ct Gem Shape: oval cab .. Product Description Gemstone Name : Chrysoberyl cats eye Number of Pieces: 1 Pc Weight: 8.78 ct Gem Shape: oval cab .. Product Description Gemstone Name : Quartz cats eye Number of Pieces: 1 Pc Weight: 8.81 carat Gem Shape: oval mix .. Product Description Gemstone Name : Chrysoberyl cats eye Number of Pieces: 1 Pc Weight: 9.87 ct Gem Shape: oval cab .. Product Description Gemstone Name : Chrysoberyl cats eye Number of Pieces: 1 Pc Weight: 10.04 ct Gem Shape: .. Product Description Gemstone Name : Chysoberyl cats eye Number of Pieces: 1 Pc Weight: 13.90 ct Gem Shape: oval cab ..